Apparently, the Queen is a Doctor Who fan, and considers Eccles one of the best incarnations. ^_^ And on that note, whatever you think of the new version of War of the Worlds, this is easily the best review you'll read of it. 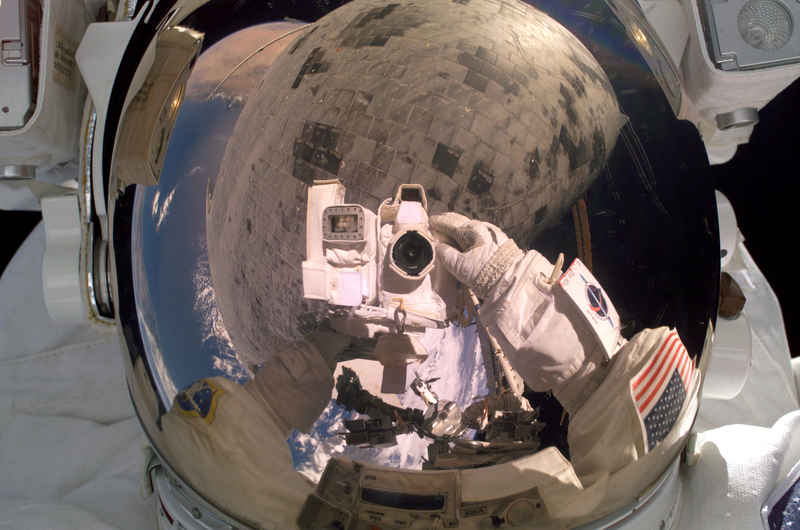 A remarkable photo (3MB), from the latest shuttle mission, shows one of the astronauts photographing his own helmet reflection of the shuttle and the Earth. This Flash animation, Bu Hua (5.5MB) should be seen. Odd little dream snippet the other night involved someone zooming off into the near distance on self-propelling boots - something like snowboarding boots, as if he was on a powered skateboard, just without the skateboard. I think we need self-powered boots. (The other bit I remember was some device that was able to send focussed sonic shockwaves - not initially audible, just something to you felt. Then it got ratcheted up, and became loud enough I could barely speak with the person beside me) For some reason, my first thoughts on waking up were the creation of an omelette using Hula Hoops. Here's a curiously engaging short comic story: Balloon Dreams. Candidate for domain name of the year: wehateyouandyourhorrendoustasteineverything.com - a surprisingly good media review site. And today's media dig from the deep is from their 1995 Telecommunication Breakdown CD, long since out of print - Emergency Broadcast Network's Electronic Behavior Control System (12MB). There's plenty of artefacting, unfortunately reflecting the original (Cinepak, woo!) compression, but it's still a nifty piece of work regardless. Are all of your carpet sharks the same (sable? I'm not certain of the terminology) coloring? Are they related, or is that just a personal preference, or indeed, how things just turned out? Just how things turned out. They are all sables, just different shades. Rush a darker sable with a white bib, Link is a black sable, Rush is cinnamon sable, and Zero is a butterscotch sable colour....at least that is what I call their colourations :-) I know there are more official terms for them. Rush was brought to us from Nevada and picked out by a friend, Ronin was adopted from my boss's daughter, and the two boys we just recently got when we moved to Arizona. We picked them out ourselves. I really prefer the more "natural" colourations - more like a classic polecat versus say albino, some of the "man-made" colours. But my next ferret, I would like a silver one I think. So I have 4 ferrets....1 rabbit and 2 mice.....yeah it is a handful! Very cool flash and EBCS! I've got two other videos from the same CD, too - "378" and "Schizo". I should prolly get those up in turn, too - EBN made such nifty work, and I'm sure there's plenty who've not even heard of them. I think we need self-powered boots. For some reason, my first thoughts on waking up were the creation of an omelette using Hula Hoops. Nah, that pic's a fake! There's no stars in the background! It's a conspiracy, I say! As a final comment, I'd have bought Balloon Dreams if it were a comic. I'd love to read more.